Teach your kids to be good stewards of money with our award-winning program. Only a few minutes a week results in lessons that will last a lifetime! Financial success and independence starts with forming the right habits and behaviors. This simple step-by-step program is designed to enhance learning and ensure success. 2 out of 3 high school seniors graduate without knowing the basics of budgeting? 18 to 24 year olds are the fastest growing age group filing for bankruptcy? 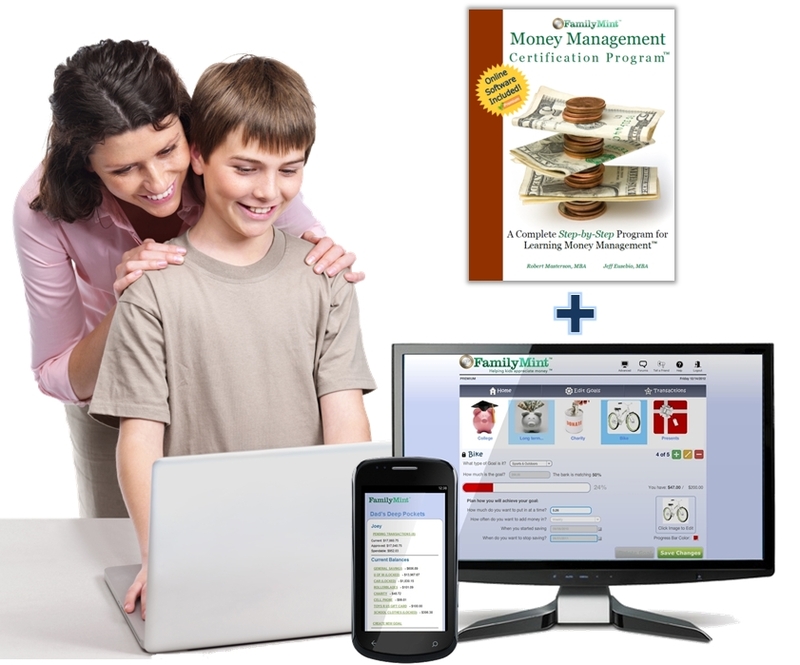 FamilyMint's Money Management Certification Program combines a 60-page step-by-step workbook with a fun online money management application for kids. Kids that complete the 2 month program develop key money habits that will benefit them the rest of their lives. Special Premium Bundle Offer - 50% off! Why has FamilyMint won so many awards? Simple – it beats any other program on the market! The FamilyMint Method™ is so effective at teaching money management that it has been the only program named “Education Program of the Year for Children, Planning & Money Management” by the Institute for Financial Literacy. Designed for kids grades 5 and up (ages 10+). This NEW program guides your child through a series of exercises which will add depth to your child's understanding, while enhancing their experience with FamilyMint's online application. 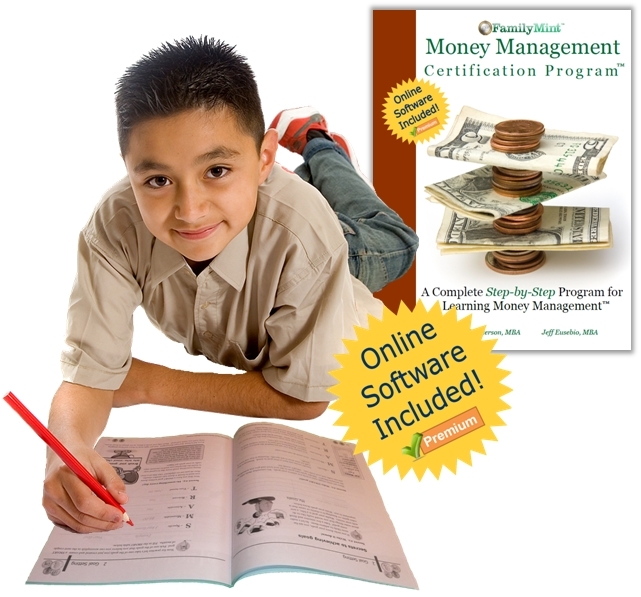 Workbook may be used in conjunction with FamilyMint's online application or as a stand alone. Did you know an astounding 97% of the population does not take the time to set goals? Goals are self-fulfilling, create energy, and can lead to extraordinary lives, yet only 3% of us take the time to think about them and write them down. Creating SMART goals is one of the great new habits your child will form through this system. Give your kids the foundation they need to be financially successful. Both the workbook and the online application provide financial lessons and practice that will develop habits and behaviors that will yield a lifetime of benefits. The FamilyMint Method™ was created by children’s money management experts and tested and used by thousands of families. This program is specially designed to create within 2 months a level of understanding unattainable with years of conventional approaches. Permanent change requires forming new habits. Habits of thinking differently, of planning differently, of reacting differently, of behaving differently. Psychological research proves it takes at least 2 months to form a new habit. The FamilyMint Method™ is built around this basic truth. Transactions: Makes it simple for children and parents to see exactly where the money is going. Goals: Kids can set up as many goals as they choose with guidance on how to achieve them. Mobile access: Any mobile phone with an internet browser will be able to access FamilyMint Mobile. Unlimited users: Set up any number of kids and personalize for each. Save & Secure: Use SSL encryption to keep data secure. Allowance automation: Just set it and forget it. No more missed payments. Automated interest: Parents can set up interest payments that really motivate savings over spending. Matching deposits: Parents can set up automatic matching deposits for select goals. How has FamilyMint helped you? FamilyMint is proud to be listed on the JumpStart Coalition for Personal Financial Literacy.